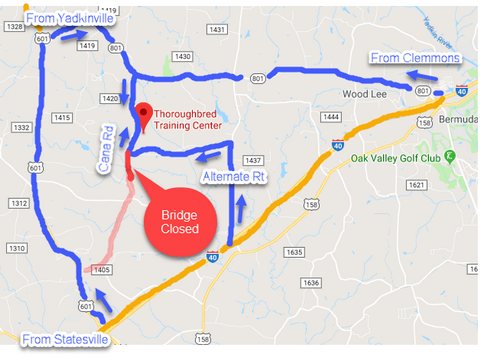 Directions: TTC is conveniently located in Mocksville, in the Piedmont Triad area of North Carolina. It is a few minutes off I-40 between Winston-Salem and Statesville. TTC serves the surrounding areas of Winston-Salem, Clemmons, Lewisville, Greensboro, Statesville, and Charlotte, all within a short drive. Alert: Cana Rd (SR1411) will be temporarily closed for the replacement of an existing bridge, starting October 1, 2018 at 8am. Cana Rd will be closed between Pudding Ridge Rd and Eatons Church Rd until April 2019. Turn right on Cana Rd, Go 1.6 miles, TTC is on the left. Turn left on Cana Rd, Go 1.6 miles, TTC is on the left.